Over the past three seasons, 210 teams have participated in bowl games. 47 of those teams had losing records in the years immediately preceding their bowl game. This semi-regular piece will showcase the losers from 2013 who just might find themselves participating in Capital One Bowl Week in 2014. 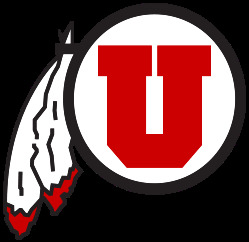 For our lucky thirteenth installment, I will finally shed my east coast bias and examine a Pac-12 team, the Utah Utes. Coming off their first losing season since 2002, the Utah Utes began 2013 with an impressive home win over in-state rival and mid-major up and up-and-comer Utah State. They followed that up with an expected thrashing of IAA Weber State. Standing at 2-0, the Utes hosted Oregon State and fell in an overtime thriller 51-48. They rebounded and beat their big rival BYU the following weekend, marking their fourth consecutive win over the Cougars. They lost at home on Thursday night twelve days later when quarterback Travis Wilson threw six interceptions. Standing 0-2 in Pac-12 play the Utes pulled off a huge upset by beating Stanford in their next game. The win moved them to 4-2 overall, but after playing five of their first six games in the friendly confines of Rice-Eccles Stadium, four of their final six would be on the road. The Utes were not up to the road challenge, losing five consecutive games to fall out of bowl contention before beating listless Colorado in the season finale. What Did the Utes Do Well? Play well at home. While they only managed a 4-3 mark at home, including just a .500 record against IAA teams, the Utes beat a quality Utah State team and the eventual Pac-12 champion Stanford in Salt Lake City. Their three home losses all came by seven points or fewer, and each came to teams that qualified for bowls. Their loss to Oregon State was in overtime, their loss to UCLA was by just a touchdown despite six turnovers, and their loss to Pac-12 South champ Arizona State came by just a single point. By contrast, the Utes won just once on the road and each of their four road defeats came by at least eleven points. What Didn't the Utes Do Well? Protect the football. One of the main reasons for Utah's 2-7 league mark was their league-high 24 turnovers in Pac-12 play. The Utes were tied with Washington State for the most turnovers within the conference but the Cougars at least ran about 50 more plays over the course of the nine-game conference season. I've already highlighted their six-turnover debacle against UCLA, but they also coughed the ball up three times in the overtime loss to Oregon State (while forcing none of their own), three times in their close win over Colorado, and four times in their loss to Southern Cal. The following table lists Utah's performance (in conference play only) in a few key categories and their respective conference rank in those categories. To help you read the table here is a handy translator. Conf: The Conference Utah played in. With the ever-changing college football landscape, this is helpful. Coach: Who was leading these yahoos into battle? YPP: Yards per play. The number of yards per play the Utes averaged in conference play. YPA: Yards per play allowed. The number of yards per play the Utes allowed in conference play. Net: Yards per play net. The difference in YPP and YPA. Higher is better. OTD: Offensive touchdowns. Touchdowns scored by the offense (no kick, punt, interception, or other returns are counted) in conference play. DTD: Defensive touchdowns. Touchdowns allowed by the defense (no kick, punt, interception, or other returns are counted) in conference play. Pythag: Adjusted Pythagorean Record. Take offensive touchdowns and defensive touchdowns and plug them into a handy formula to estimate the number of conference wins. For a full rundown of the APR, continue reading here. In 2010, the Utes began the year 8-0 and were ranked sixth in the country. In early November, they hosted TCU, ranked fourth at the time, in a pivotal mid-major clash. The Utes lost by 40. If I were a hack journalist, I would tell you that the loss to TCU demoralized the Utah program as they have gone just 20-22 since that great start in 2010. However, a more plausible account is that Utah moved into a more difficult conference and has faced a more arduous schedule. Using the SOS metric at college football reference, Utah has faced a progressively difficult schedule since joining the Pac-12 in 2011, culminating in the nation's most difficult schedule last season as detailed in the following table. Whether or not you believe Utah absolutely had the most difficult schedule in the nation last year (I do) is not the point. By an objective measure, they had arguably the toughest schedule in the nation and still managed five wins. Replace a few of those Pac-12 squads with some Mountain West punching bags, and voila, welcome back to the postseason. The bad news for Utah fans is that the schedule does not get appreciably easier in 2014. The Utes open with a IAA jobber in Idaho State, but follow that up with a challenging mid-major opponent in Fresno State. The Bulldogs and Utes were once conference mates in the old Western Athletic Conference, but have not played since the 1999 Las Vegas Bowl. After a bye week, the Utes finish up their non-conference schedule by taking a trip to Michigan. The last time the Utes played in the Big House, they won, and finished the season unbeaten and ranked second in the country. You may notice one team conspicuously absent from Utah's non-conference schedule, BYU. The Utes and Cougars will not play this season marking the first time the arch-rivals have not faced off since 1945! Once conference play begins, the Utes will face the same Pac-12 teams they battled last season with the venues inverted. Their four league home games will include Arizona, Oregon, Southern Cal, and Washington State. The Utes lost to all four teams last season, but with the homefield advantage, should be able to find a win or two in 2014. The road schedule includes trips to Arizona State, Colorado, Oregon State, Stanford, and UCLA. The Utes only managed a 2-3 mark against those five teams in Salt Lake City last season, so expecting anything more than a pair of wins on the road might be pushing it. The Utes were not that bad in 2013. By the SRS metric, the Utes were the 36th best team in college football last season. By the Sagarin Ratings, they were 34th. They beat three quality teams in BYU, Stanford, and Utah State. Every team they lost to, even Washington State went to a bowl game. That being said, as we already discussed in the section on the 2014 schedule, there are no real breathers on the upcoming slate. The Utes could once again beat a few quality teams, and lose seven games to bowl-eligible teams. The Pac-12 is just that deep. Still, it could be worse. The Utes could be a bad team facing a schedule this daunting. Will Utah miss out on the postseason for the third consecutive season in 2014 and push head coach Kyle Whittingham closer to the unemployment line? If they do, it would mark the first time they endured such ignominy since they were coached by Jim Fassel. Yes, that Jim Fassel. Moving from the Mountain West to the Pac-12 was always a calculated risk, but to paraphrase Super Chicken: They knew the job was dangerous when they took it. Methinks Utah will finish the 2014 regular season with either five, six, or seven wins depending on in no particular order, the health of quarterback Travis Wilson, their proclivity for turning the ball over, and their record in close game. Were I a betting man, I'd wager on the Utes getting to bowl eligibility, but not much more than that. Over the past three seasons, 210 teams have participated in bowl games. 47 of those teams had losing records in the years immediately preceding their bowl game. This semi-regular piece will showcase the losers from 2013 who just might find themselves participating in Capital One Bowl Week in 2014. In our twelfth installment, we an examine our first SEC team, Arkansas. While the 2013 season was among the worst in recent Arkansas history, the Razorbacks opened the year with perhaps their best performance in beating a bowl bound Louisiana-Lafayette squad by 20 points. They followed that up with a closer than expected win over IAA Samford (but no son) and won their final game of the season the following week against a Southern Miss team in the throes of a 23-game losing streak. In their final non-conference game, Arkansas raced out to a 17-point third quarter lead, but Rutgers scored the games final 21 points to eke out a win. Once conference play began, the results were mostly grisly. South Carolina and Alabama scored 52 points on the Hogs in consecutive weeks, and through their first six league games, Arkansas had been outscored by 157 points. However, the Hogs didn't quit on first year coach Bret Bielema, losing first to Mississippi State in overtime and then squandering a late lead to LSU to finish without a conference win for the first time since 1942! What Did the Razorbacks Do Well? Run the ball. Obviously, when you finish without a conference win, there is usually not a whole lot you do well. However, Arkansas was legitimately strong running the football. The Hogs nearly produced two 1000-yard rushers, and as a team averaged a healthy 5.28 yards per carry (tied for 17th nationally). Those rushing numbers are even more impressive when you consider that Arkansas had no semblance of a passing attack. As a team, Arkansas averaged under six yards per throw and completed fewer than 50% of their passes (118th in the nation). What Didn't the Razorbacks Do Well? Everything else. I've already touched on their putrid quarterback play (the worst among major conference teams outside of Kansas), but the Hogs also boasted the SEC's worst defense in terms of yards per play allowed. Conference foes very nearly rang up seven yards per play against the Hogs 'resistance' (6.86). Arkansas also fared poorly in the turnover department, giving the ball away a league high 19 times in conference play. The following table lists Arkansas' performance (in conference play only) in a few key categories and their respective conference rank in those categories. To help you read the table here is a handy translator. Conf: The Conference Arkansas played in. With the ever-changing college football landscape, this is helpful. YPP: Yards per play. The number of yards per play the Razorbacks averaged in conference play. YPA: Yards per play allowed. The number of yards per play the Razorbacks allowed in conference play. Before his famous motorcycle accident, Bobby Petrino had enjoyed solid success at Arkansas. His defenses over his final two seasons were nothing to write home about, but the offensive attacks keyed by future NFL draft picks Ryan Mallett, Joe Adams, Greg Childs, Knile Davis, and Tyler Wilson ran amok over the SEC. After Petrino lost his gig thanks to his indiscretions, noted maniac John L Smith took over. Even with Tyler Wilson still under center, the offense declined and the defense went from bad to worse. The Razorbacks stole a successful Big 10 coach after their disappointing season and were prepared to return to their competitive ways. Not only did the defense continue to decline, finishing as arguably the worst in the SEC, the offense also faded. Now the Razorbacks enter 2014 having won just a pair of conference games over the previous two seasons. Playing in the SEC West, its a given Arkansas will have a difficult slate in 2014. Aside from their conference dates, the Razorbacks also have a few tests outside the SEC. Arkansas plays the requisite IAA opponent in Nicholls State and a low-level mid-major in UAB, but they also face a strong mid-major (Northern Illinois) and travel to play a major conference team (Texas Tech). The Red Raiders are hardly an upper-crust Big 12 team, but Arkansas will likely be an underdog, particularly on the road. Arkansas should be expected to win their trio of home games, but an upset by Northern Illinois would not be the greatest shock in the world. 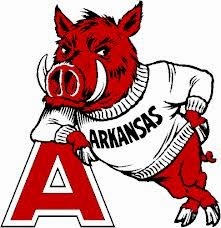 A reasonable Arkansas fan should be happy with a 3-1 mark in non-conference action. That means the Hogs would need to scrounge up a trio of league wins to get to bowl eligibility. In SEC play, the Hogs host Alabama, Georgia, LSU, and Ole Miss. The Hogs could be underdogs in all four games, but a win in one or two is certainly a possibility. Optimistically, if Arkansas wins a pair, they would need to grab one conference road win to get to bowl eligibility. Their road conference slate includes trips to Auburn, Mississippi State, Missouri, and Texas A&M. Winning at Auburn would be a huge reach, but Mississippi State, Missouri, or Texas A&M would only qualify as a minor upset. While three conference wins is not inconceivable, Arkansas may in fact find themselves underdogs in all eight conference games! Bret Bielema's track record. We'll see in a moment why his track record may not mean as much you think. Regardless, there is no denying the success Bielema had at Wisconsin. Over seven seasons, his teams went 68-24 overall, finished the season ranked in the AP Poll five times, and played in three consecutive Rose Bowls to close his tenure. Prior to Wisconsin's run, the last Big 10 team to appear in three consecutive Rose Bowls were fellow mustelidae, the Michigan Wolverines from 1976 through 1978. Full disclosure, the idea for what I am about to write came from an excellent piece by Matt Hinton on why recruiting rankings matter. During his time at Wisconsin, Brett Bielema went a collective 37-19 against Big 10 opponents (not including the Badger's pair of wins in the Big 10 Championship Game). But who did his Badger teams beat in those 37 victories? The answer is that more than half of those wins came against the trinity of Indiana, Minnesota, and Purdue. Against those three teams, Bielema's Badgers were 19-0. Against the rest of the Big 10, his teams were 18-19. 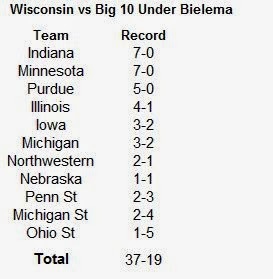 The table below lists Wisconsin's record against each Big 10 team under Bielema. There is something to be said for beating the teams you are supposed to beat, and Bielema's teams did just that, finishing 31-8 against Big 10 teams they were favored against. However, in the SEC, particularly, the SEC West, there are no Indianas, Minnesotas, or Purdues. A wise man once said, 'If you can't spot the fish at the table, you are the fish'. Fish is poker parlance for the weak player(s) that keeps everyone else in the black. Competing for conference wins against the likes of Alabama, Auburn, LSU, Mississippi, Mississippi State, and Texas A&M may mean Arkansas is the fish for the foreseeable future.